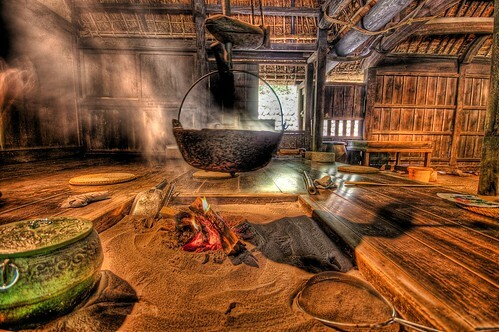 Japanese Cooking, originally uploaded by /\ltus. Click on pic, see it in Flickr. Not an easy thing to do...picking one pic over the month of pics. I think it probably has to do with my mood at the time of choosing more than anything. The choice came to rest on this one above, originally from the search word "warm". Here it is in large. The character of the pot's shadow in the sand, and the embers, and the woodgrain and the color of the foreground pot. Your eye is not drawn to one spot, but to a series of spots, and then they start over again. This pic has fascinated me every time I look at it. Really takes you to a place, and a Zen one at that. But who could have argued if I had picked either of these following mention-worthy pics, because they do the same: soul, or spring. Fttingly, but unexpectedly, I have noticed in looking at these three words that I think I like them together: warm, soul, spring. 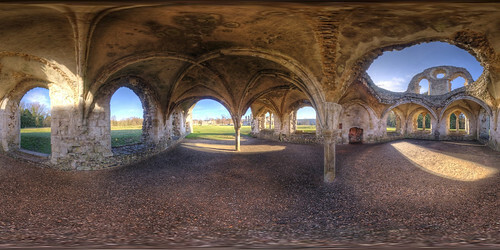 Waverley Abbey, originally uploaded by Moose2000. CLick on pic, see it in Flickr. A really nice panorama that is an impossible shot without HDR. The "inside" and "outside" exposures could never be simultaneously captured otherwise. As usual, it's better in large. 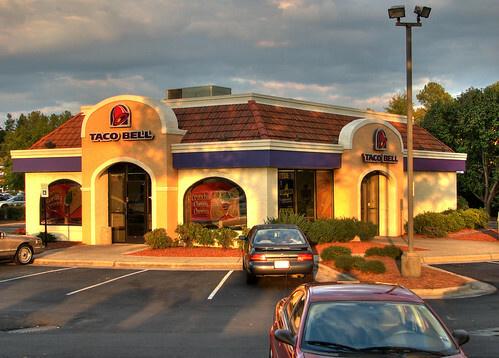 I Love Taco Bell, originally uploaded by _moonpie. Click on pic, see it in Flickr. Island Fedje. 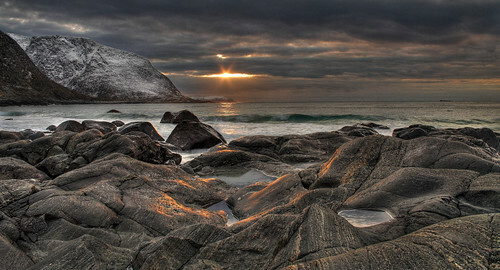 Norway (HDR), originally uploaded by AlexEdg. CLick on pic, see it on Flickr. 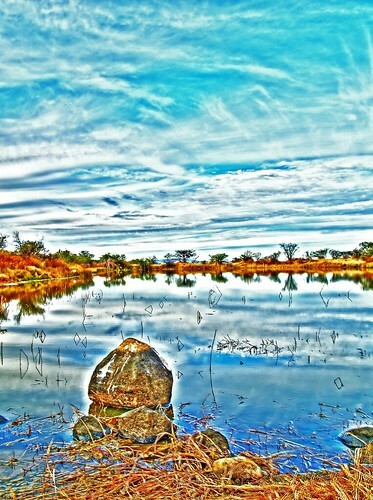 This pic is an HDR but that's not all. 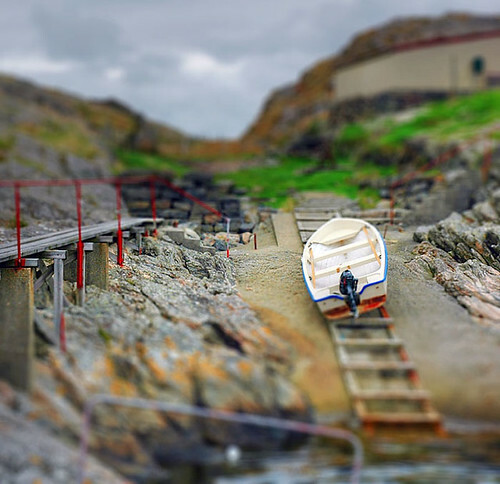 Its appearance as a miniature boat set in a diarama comes from being "tilt-shift" processed. Kinda neat. Here it is in large. And for kicks, compare it to the original unprocessed photo. 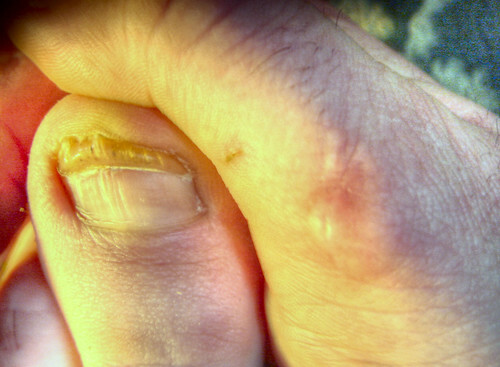 update, recovery?, originally uploaded by Rob!. Click on Pic, see it in Flickr. 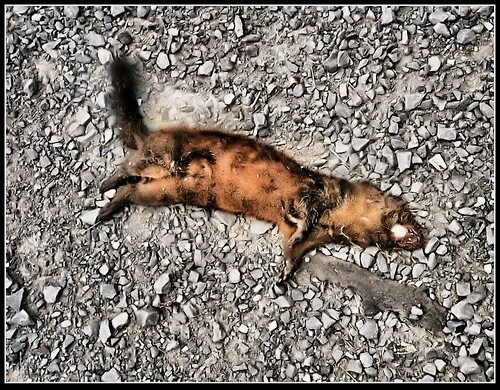 Boy, I thought a road kill shot a few days ago couldn't be topped, but Flickr will surprise you sometimes. It's not always the good pics that have a level of mystery. In this case, the mystery revolves around some burning questions: Why was this done in HDR? Why was this posted to the public? How on earth did this one come up with "wind" as a search word? And if you look at the key words he entered used for this pic on Flickr, the poster definitely realized that the they needed to include some unsavory ones. That's actually a bit comforting. llibreria, originally uploaded by Mor (bcnbits). Click on pic, see it in Flickr. 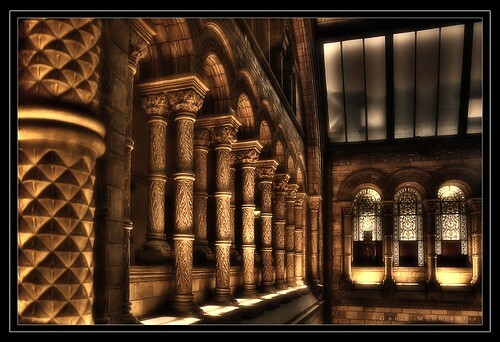 This one tells a story, and HDR really makes the interior light up with warmth. Here it is in large. 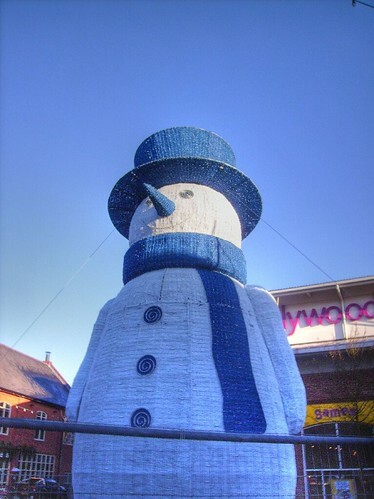 Frosty HDR, originally uploaded by nothingamusing. 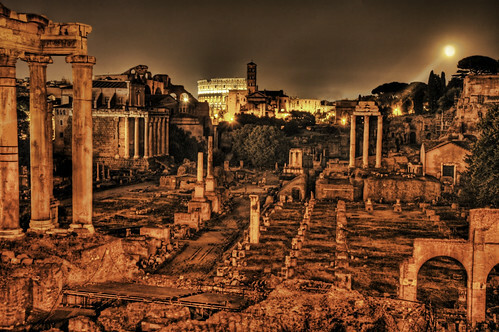 Ancient Roman Forum by Night, originally uploaded by Stuck in Customs. Click on Pic, see it in Flickr. Saw 300 over the weekend. Hence "ruins" as the search word. I like the low light in this shot. I believe this is the third Stuck in Customs photo on the blog to date (others being March 8 and March 12 Thrillers). He has other ruins shots too, like this and this that are pretty darn good, but I like the lighting/exposure in this one best, especially for the coliseum in the background. To get the full effect, see it in large. On 300, it's a technological CGI marvel, but gratuitiously bloody and repetitively so. That wouldn't have been so disturbing were it not for the group of dudes in front who were visibly into heavily rooting for the Spartans, like we were watching a football game. I suppose that makes sense because Spartans is a common mascot and while the Persians had the big bad army, you don't ever see the "Central High Persians" playing football. That's something that Leonidus can take credit for I suppose. Just riding along, I see this mink, originally uploaded by Felip1. Click on pic, see it in Flickr. My apologies for this one, but hey, rules are rules. When this pic came up in the search, I had little choice...it kinda selects itself as the Chiller. The title of this photo provokes some thought..."Just riding along, I see this mink..." Makes you wonder what came afterwards! In my mind, I think I settled on one of the less disturbing finishes: "and so I had the urge to take a photo." Hmmmm...definitely thought provoking. It's the weekend so I thought I'd do something fun with this post. During the search for pics yesterday, I ran across a pic that shows off how HDR can really bring out information that a normal photo cannot. 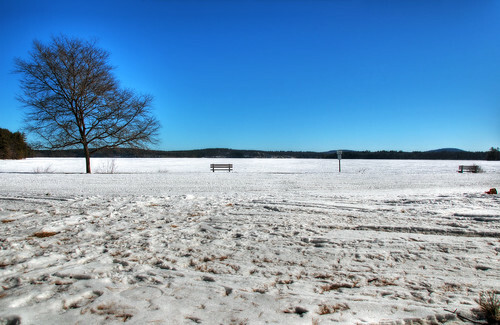 The following two pics show a "before" and "after" presentation of HDR techniques. Unfortunately, I can only link to them because the blogging function for them appears broken...Twin Cities Bridge at night in non-HDR version and HDR version. Kinda shows how HDR can affect things, in this case very positively I think. 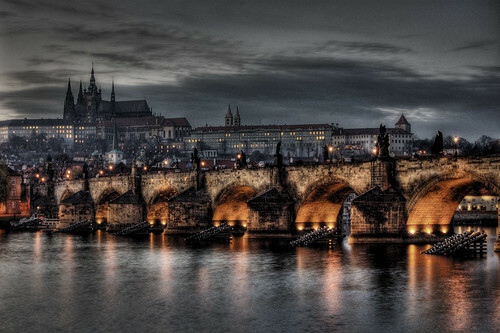 Charles Bridge, Vltava and Hradcany, Prague, originally uploaded by stevacek. Click on pic, see it in Flickr. Pretty sublime pic here that shows off HDR's capabilities very well. See it in large and its even better. Near Sparta, Wisconsin. Uploaded by Luap777. CLick on Pic, see it in Flickr. There are oops and then there are oops. But look at this shadow and help me figure something out...where is the photographer? Conceptually, you could use a timer and sneak away so your shadow was not in the pic. Okay, so your shadow is not in the pic...what about the tripod? WTF? Maybe Luap777 thought about it and used a timer to improve on one of his previous efforts (!?). Let me say first thing with this one... you have to see this in large. 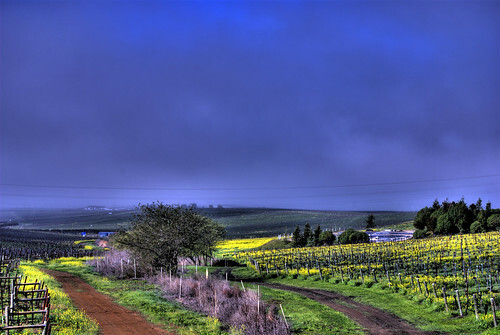 Only then does the HDR really accentuate a mood and take you right into this to place, whether you want to go or not. 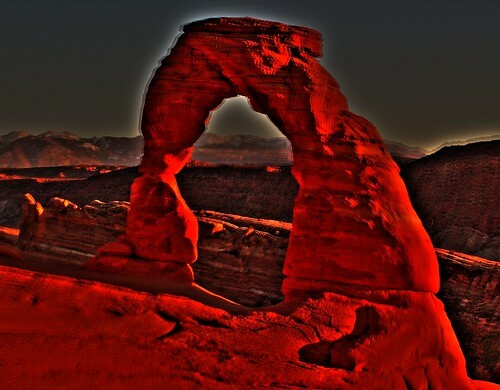 Delicate Arch HDR (without tripod), originally uploaded by KoenigNazgul. Click on pic, see it in Flickr. Please view with caution. Oops too late. I probably shouldn't have posted this pic, because after viewing it, I think I have developed a chronic blink (it took all of three seconds). Its Flickr caption says "Ominous. Brooding". I'm pretty sure they forgot "Annoying". Þingvellir - Iceland originally posted by galbertss. Click on pic, see it in Flickr. It's Iceland again. I really have to get there someday. You may recall my last post from Iceland. This one is equally amazing, but this time its for the incredible range of color saturation and texture...a true feast for the eyes. You'll want to see it in a larger size. I'm curious though...what is the letter "Þ" anyway? 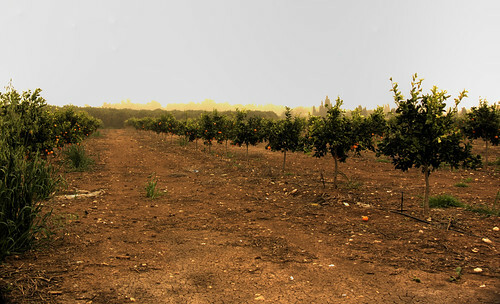 Orange Grove, originally uploaded by vad_levin. Click on pic, see it in Flickr. uuhhh...Hmmmm. I keep looking at this photo waiting to see something. Try it......then try it in large. Unfortunate because if you look on his Flickr page, vad_levin has some nice pics, but this one...(in my best Billy Crystal/Miracle Max impression)..."not so much". HDR 1--61 originally posted by ajschroetlin. Click on Pic, see it in Flickr. I sometimes listen to Rhapsody during postings and as I was about to post I was on the Carnival CD by Kasey Chambers. "Coulda been the color of a carnival. It coulda been a light in the dark..." It seemed a natural for an HDR search word. This pic was an interesting yet simple concept. I like the triumverate of colors on the table surface. But mostly I just connected with this pic because I've always loved those neon light sticks. Sidenote: For some reason when you look at it in Flickr it has much less noise...so click on the pic. DSC01710 HDR, originally uploaded by trikked. Click on Pic, See it in Flickr. Oy. The colors and architecture of Venice make it a terrific subject for HDR photos. I've seen a lot of great HDR pics of Venice. Unfortunately, this pic isn't one of them. Old Walls Collection (III), originally uploaded by Atlantico 2006. Click on Pic, see it in Flickr. There's some beautiful mystery in this photo...especially with the scattered flowers. Again, you are literally missing stuff unless you view it in large size. Strangford lough, originally uploaded by FujiBlonde. Click on pic, see it in Flickr. Unless there is a nuclear weapon going off beyond the island in the background, it's pretty obvious what the difficulty is here: an intense halo from overcooking the HDR rims both the wall and the island...like too much Margarita salt. Orcutt Rd Looking West, originally uploaded by AshSLO. Click on Pic, see it in Flickr. HDR works well with and accentuates those scenes where there are multiple lighting scenarios in foreground, midground, and background. To be appreciated this pic must be seen in large. It's the detail in the subtle background, especially the fence parallel to the ridgeline, that give this pic depth and make it interesting. HDR has taken the colors into a high satutation but this is somehow okay with the yellow flowers. The power lines do detract, but I can confidently state that this pic would be much less interesting without HDR. With only 70 pics in this search to choose from, this is far from the best Thriller I have posted, but that's part of the game. Almond Trees, originally uploaded by kehena. CLick on Pic, see it in Flickr. I picked a word that came up with just 70 photos today. There were not too many bad ones, but I had to select something. I picked this because, while the subject was interesting the colors are way wrong and way too far from reality. It appears that the HDR has not only turned the road blue/violet but has accentuated the chromatic abberation of various blue blobs of sky peeking through the trees. 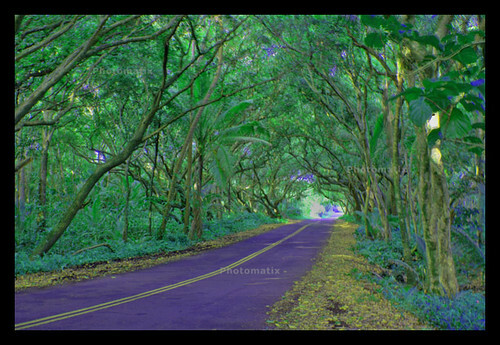 Strange colors and intensities can result from HDR and should be more properly adjusted during the processing. Other than that, I don't really have a serious bone to pick with this photo. Hard choosing today from excellent pics, but here is one that struck me like a Remington painting from the western frontier. I ain't lookin' for perfection, just a nice HDR that catches you somehow, and this fills the bill very well. You can see a grayish patch in the sky, but it's not that noticeable...that could be an HDR artifact or even a cloud. My friend Tony will sympathize as he sometimes has a camera artifact like this that he cannot shake in certain lighting and zoom conditions. Regardless, this pic is a must see in large on black. I picked today's search word because Fedex dropped off my new Olympus yesterday afternoon and I got to play with it some today (:>). And I noticed something after looking through most of the search results (982 pics)...it was painfully obvious that it was much more difficult to find a poor shot (seriously). Olympus users have better sense, I guess. So after a series of Chillers the last few days where I chose them in part for their nonsensical subject matter, here is one with decent subject matter that I picked for a different reason...it's obviously totally overblown. The taker admits as much and said that overblown look is what he's after. Fair enough, but in my opinion, stuff like this just bleeds away the integrity of HDR technique. See it here in large, if you must. It is remarkable how much HDR photos can look like paintings when they are expertly done. Here's a good example. Really excellent subject matter here too...embers, smoke, wood, earth, metal...very elemental. A must see in large size. Flooded park, originally uploaded by Exil-Fischkopp. Click on pic, see it in Flickr. 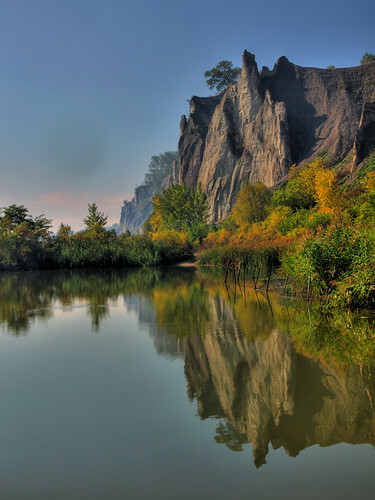 The Flickr descriptor says it all: "This is a HDR-Image created from a series of 5 with Picturenaut. The results from Photomatix are much more impressive, but $99 for a tool with just one use is too much for me..."
I would agree the tool is too much for you. 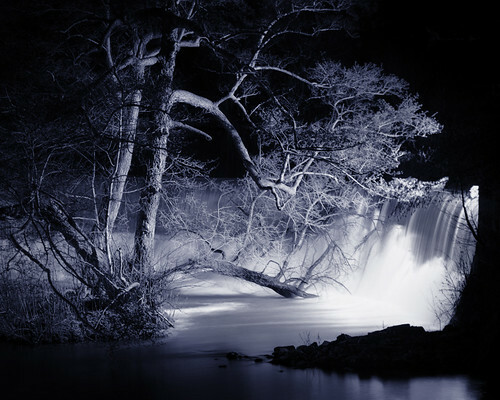 Weir At Night (hdr), originally uploaded by floyduk. Click on pic, see it on Flickr. Mesmerizing shot I could stare at for a while. It's erie and yet tranquil. Clearly not possible without HDR. Here it is in large. A tailight? In HDR? It looks like one of those "taken by accident" shots in the driveway after getting a little tipsy at the the Christmas party. Correction...very tipsy. I know people are experimenting with HDR, but aren't we limited by one's conscience in posting some of this stuff? Apparently not. If my neighbor actually saw me lining up a shot like this with a tripod, I would never hear the end of it. Searched on "Spring" because we had a really nice "first Spring day" kind of day yesterday. Lot's of good stuff came up. 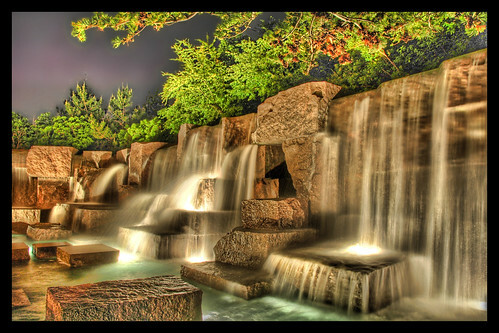 Chose this Stuck in Customs favorite because real fountains tend to mesmerize me and this photo does also. Best viewed in Large on Black. 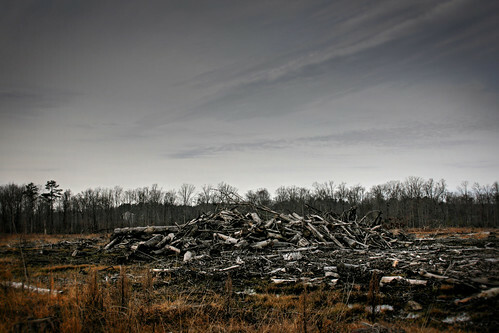 Cool Springs Woodpile, originally uploaded by dhowellphotography. Click on pic, see it on Flickr. Hmmmm. Maybe it's me. I just don't get this one. Perhaps when viewed in large it's reminiscent of the Shire after Isengard is done with it? A tinture of irony that this came up using "Spring" as the search word. You really need to see this pick in large size. The really excellent element in this pic is the reflected sunlight on the foreground rocks...great because you can literally feel the coldness and soon thereafter the warmth of the sun comes through. I find it even shimmers if you stare at it a while. Okay. Am I missing something here? The Flickr page description for this shot is earnest but does not seem to fit this image at all: "...am trying a new program for my HDR ...tell me how you like it ...this was one of the most beautiful sights I have seen in a long time ....a half circle shaped water fall that had this island at the bottom..." Hmmmm, I am trying to see it, but I just don't get it or the pic. Am I nuts, or is this a flooded Superfund site? The Icy Pit to Hell, originally uploaded by Stuck in Customs. A simply remarkable photo that I am glad somebody took! 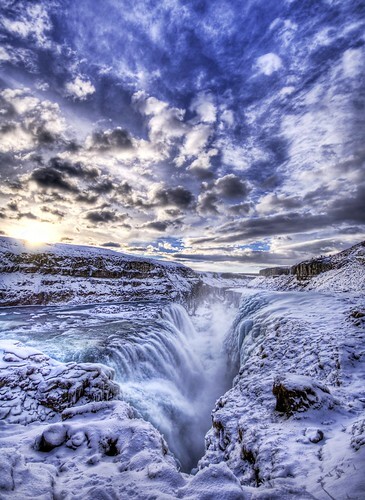 Iceland has been on my list of places to go, and I think it just went up a couple of notches. And You simply HAVE TO see it Large on Black. Walking through Stuck in Customs photos on Flickr makes you want to go to lots of places and also makes you appreciate HDR done to near perfection. And while I simply had to put up the icy pit pic above as Today's Thriller, I saw another one that caught my eye that I'll link to as an honorable mention. Definitely drips with mood. Lake Massabesic on Ice, originally uploaded by mjp3000. WTF is up with this shot? It's a shame that my search for "ice" found this pic. mjp3000 actually has some nice HDR shots posted on Flickr, but this one is not his best effort. All HDR does for this shot is give it the strange halo effect. Little Chapel Guernsey, originally uploaded by spondle. Click on pic, see it on Flickr. Not only a great photo, its an almost perfect foil for HDR. Each individual pebble shard or shell is brought out with enhanced exposure in a way that only HDR and human vision could accomplish. Must click on image to visit flickr page and see large to do this pic justice, or even easier...here's the link. Yikes. I feel a bit queasy. I am reaching for my Pepto. The weight of the HDR in this photo is totally crushing. 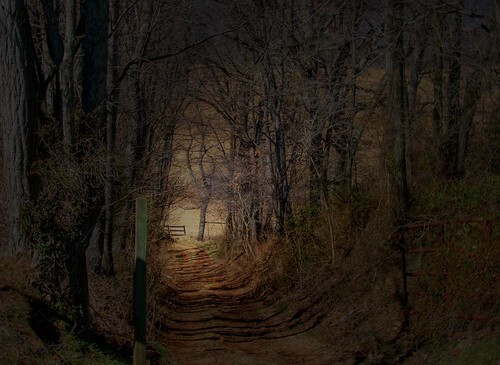 The walk home, originally uploaded by LynchburgVirginia. Click on pic, see it in Flickr. My take on the pic above: Bravo...I think this is an extraordinary shot and a fantastic use of HDR technique. It really draws (more like yanks) you into another world. Many things come to mind and some are a bit TIm Burtonesque, but it has hope in it too. If you look on LynchburgVirginia's Flickr site, you can also see this pic in sepia. This being the first post, there are some ground rules I use to find a set of photos from which I choose: Pick a word for no particular reason, then search on Flickr or Pbase with both "insert word here" and "HDR". Today the word is "Soul"...generated just now because I have been listening to Jackson Browne’s Solo Acoustic CD on which he tells the story about getting an audience request for playing Peaceful Easy Feeling while on stage one nite (here's a link to it...http://rhaplinks.real.com/rhaplink?rhapid=3096143&type=playlist&title=Playlist&from=bestbuy). Being an Eagles tune, Peaceful Easy Feeling is obviously not Browne's song(! ), although he did write Take it Easy for the Eagles. Nonetheless, he decides "what the hell" and gives it a shot (who would ever do that? ), but, as he recounts on the CD, he got a huge collective groan from the audience when messed up the line that said, ”…what a woman can do to your soul”. He sang instead,”...what a woman can do to a man.” So that's a long-winded way to relate how I picked "soul" as the search word, and the semblance of a moral to the story: that it’s a mistake to think that women do things to men, they really do things to men's souls. ENOUGH. Enjoy the pictures. What can I say? Not a good one here in my opinion. That aura fringing around the tree is typical of an overblown HDR. Let's not talk about the composition. And yes, oddly enough, it did come close to putting me in retinal rehab.